Hi there! 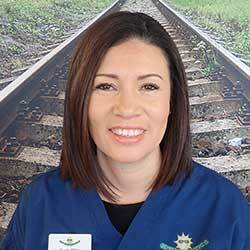 My name is Sueli, I am a Registered Dental Hygienist and a proud member of Team Noble at Orthodontics at Don Mills. I have been in the dental hygiene field for 7 years. I am extremely passionate about my job and love helping our clients create their perfect most fulfilled smile. “The only way to do great work is to love what you do” is a quote that reminds me of my great passion for orthodontic hygiene. Orthodontics at Don Mills provides a positive, enjoyable and pleasant environment. I assist Dr. Noble and Dr. Cassolato with orthodontic procedures and provide each client with the comprehensive knowledge of good hygiene habits and an immaculate smile. Outside of the office, I have a vast majority of hobbies. I enjoy going for long walks along the lake with my cute Yorkie named Heyme. I also enjoy hiking, snowboarding, and hot yoga.